In my quest to be more on the ball as regards literary news and events, I thought I’d quickly google “literary festivals” and note them down. Ha ha! Imagine my shock when it soon became apparent this would be no small feat. The list of literary and book festivals is almost endless. Indeed, if you attempted to visit them all, you’d run into trouble as so many overlap – you’d be rushing from one end of the country to another. My not-too-brief trawl reveals I could start today with the first event of the UEA spring lit fest, before heading off to Bath, Oxford and York next month, Stratford at the end of April, followed by Swindon (who knew?! ), and then Hay in May, Worcester in June, Penzance in July, Edinburgh in August, Budleigh Salterton and Soho (!) in Sept, before rounding the year off with a bumper month of Henley, Cheltenham and Manchester in October! And that’s before I even look at the local ones, including Oswestry next Month, Shrewsbury children’s bookfest in May, and Wellington in the Autumn. I’m exhausted just looking at all these events. How did I never before realise just how large a circuit there was for all things literary. And how the same names seem to come up so frequently at the various events. Oh, so there are writing calendars…! Following on from yesterday’s post, I discover, of course, that there is already a most excellent writing calendar on Sally Quilford’s blog http://writingcalendar.wordpress.com/ – this lists forthcoming writing competitions in closing date order. Brilliant. So that deals with part of my quest. So if anyone knows of a suitable wall planner which might be aimed at the creative writing community (or even a “writing diary” if such a thing exists), I’d be interested to hear about it. In the meantime, I’ll be adding e-notes nervously to my electronic calendar…! Anyway, I’ve come to the conclusion that I need to be more on the ball as a writer. It’s no use just sitting at my desk, tapping away oblivious to everything else. I need to be keeping an eye on what’s going on in the wider world, taking note of literary festivals, forthcoming competitions, and special writing occasions. I need to be thinking ahead and doing a bit more forward planning. Today is the first day of National Short Story Week. As relatively recent convert to the joys of the medium, I think it’s a great idea. In this modern age, where time always seems to be at a premium, perhaps we’ll see a rise in the popularity of short fiction – particularly as we can now download the written word pretty well anywhere on our smart phones, iPads and so forth. 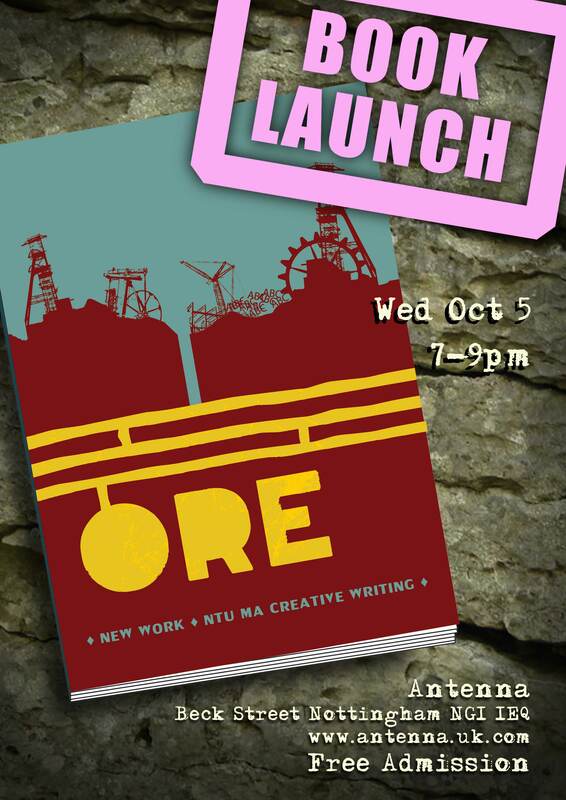 Ore features short stories, poetry and script extracts from the students of the NTU Creative Writing MA course. It includes my short story, Free Running. The anthology will be officially launched on Wednesday evening – at 7pm, Antenna, Nottingham. Entry is free and everyone is welcome.